Holiday Ornaments CAL going on in the facebook group Your Crochet Oasis starting Monday, December 3rd, 2018. Join the group by clicking here and crochet along with us! - Black, white, turquoise & ivory for penguin. 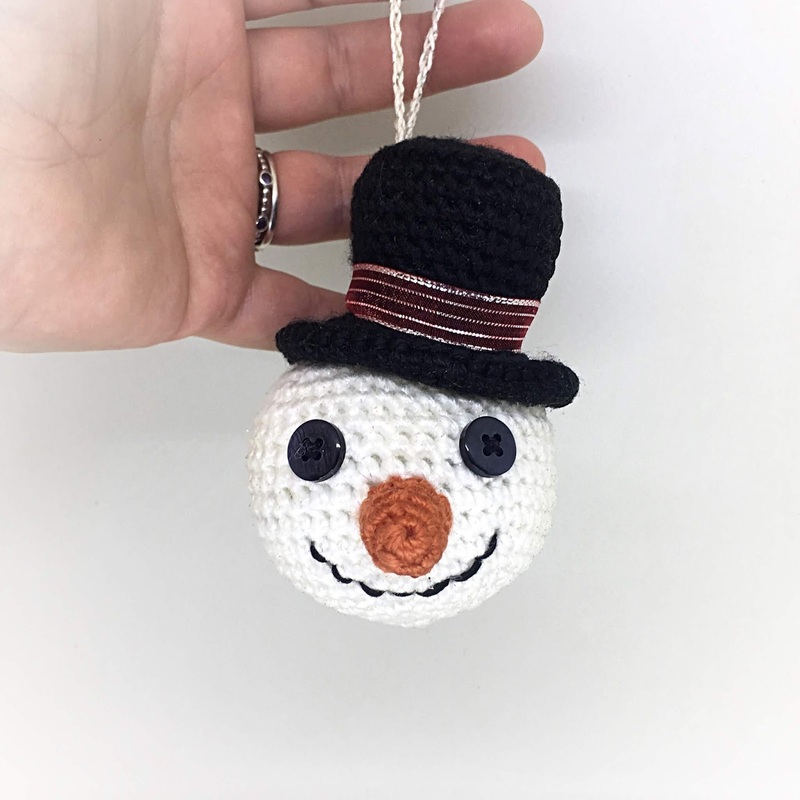 2 x 12mm safety eyes for each ornament OR small buttons (used on my snowman) Black & red embroidery floss for snowman & elf Thread or embroidery floss for hanger. Size: Each ball is approximately 2.5” when made with the suggested yarn and hook size (not including additional features). Pattern is worked in continuous rounds unless noted otherwise. If using safety eyes, insert between R11 & 12, 6 sts apart. 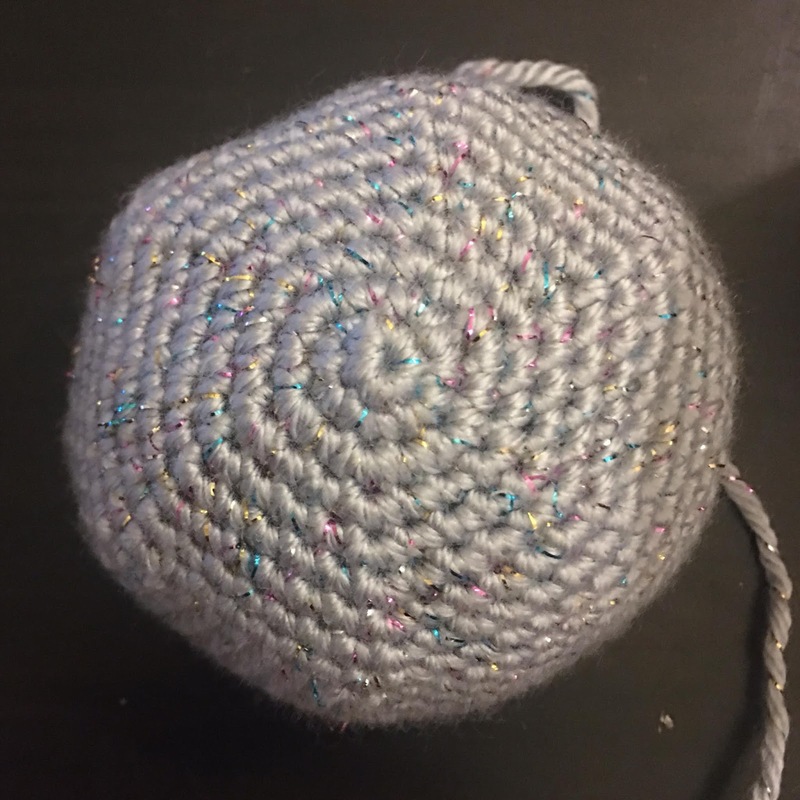 FO, leaving a long tail for sewing. Whip stitch FLO & pull tight to close. Hide ends. FO, leaving a long tail for sewing. - Sew buttons for eyes if you are not using safety eyes. - Stuff and sew the nose on 1 round under the eyes. 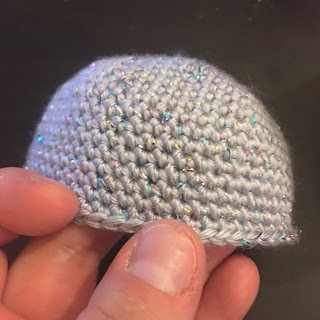 - Sew the hat on to the ornament. - Add a ribbon embellishment to the hat if desired. 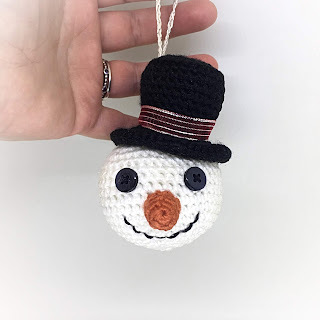 - Embroider a mouth onto your snowman. R6: sc dec x 6 (6) Change to red on the last st of this round. - Stuff and sew the nose on directly under the eyes. 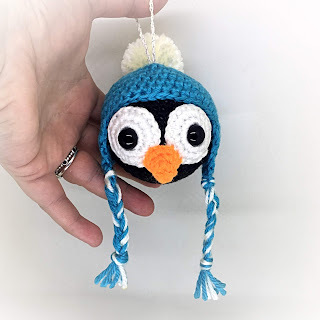 - Sew the hat/hair on to the ornament. - Sew on the ears on either side of the head, starting right under the hairline. 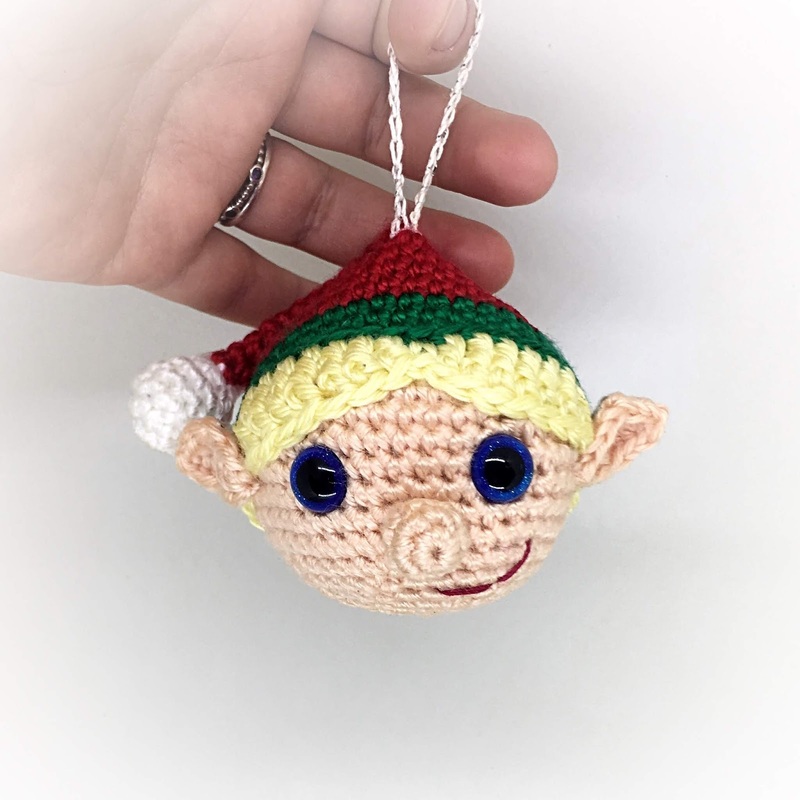 - Embroider a mouth onto your elf. R9: Fold in half and sc x 2 across. 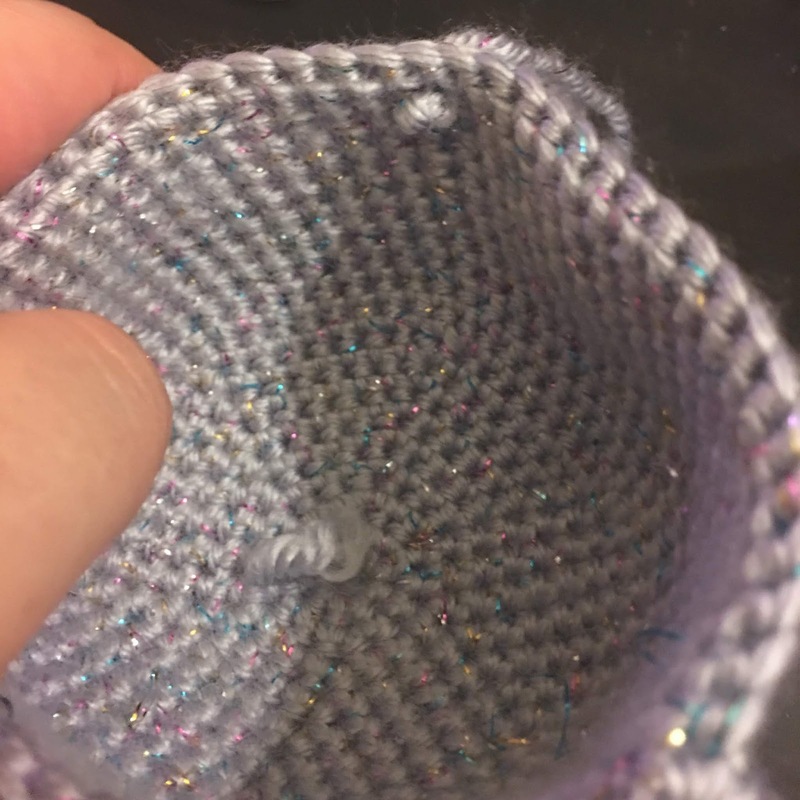 (2) FO, leaving a long tail for sewing. - Stuff and sew the muzzle on directly under the eyes. - Stuff and sew the nose onto the muzzle. - Sew the ears onto the sides of the head, 2 rounds above the eyes. - Sew the antler pieces together, 2 short to each long. 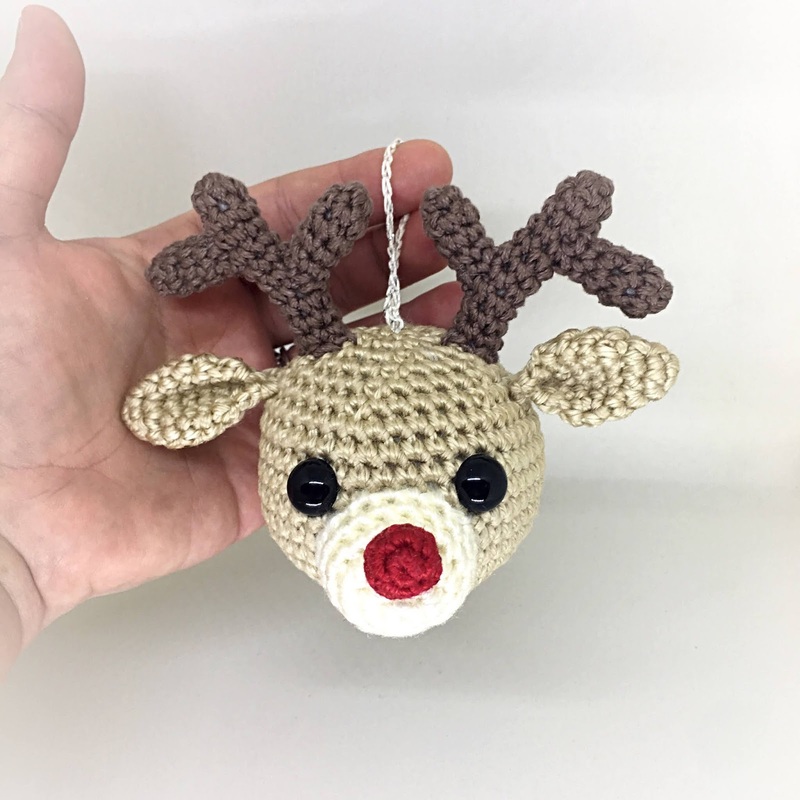 - Sew the antlers to the ornament. Don’t pull too tightly closed, leave a space in the middle to insert safety eyes (if you are using them). FO & weave in ends. Count over 14 sts from the 1st ear flap, join to 15th st and start the 2nd ear flap. Repeat R1-5. FO & weave in ends. - Stuff and sew the beak on directly under the eyes. - Add braids and a pom pom to the hat (optional). 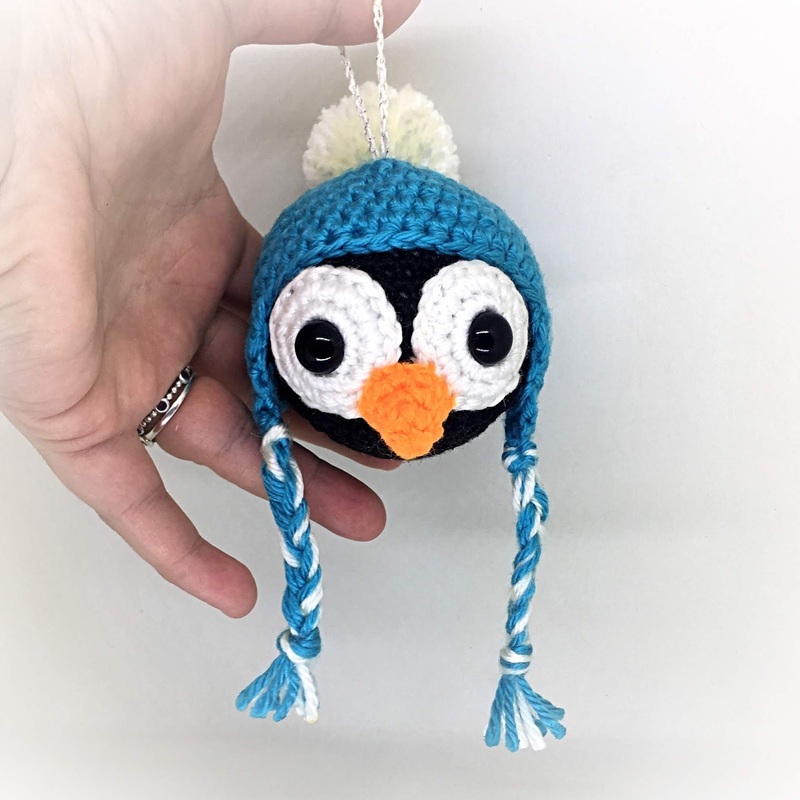 - Sew the hat onto the ornament. 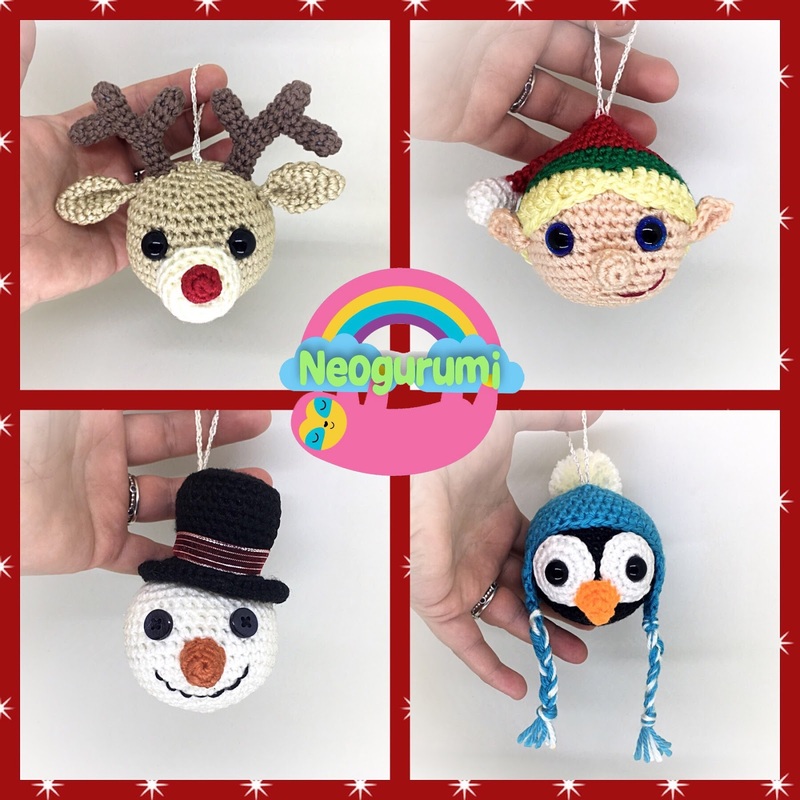 I hope you have enjoyed making your ornaments as much as I enjoyed designing them. 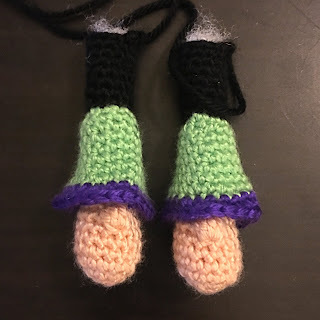 Please feel free to contact me if you need any assistance with this pattern. The photographs and pattern contained in this document are property of © Jessica Doering & © Neogurumi. No unauthorized reproduction or distribution of this pattern or content, in whole or in part, is permitted. You are free to sell any finished products made with this pattern, but please give credit when doing so. A link back to the pattern page is appreciated. 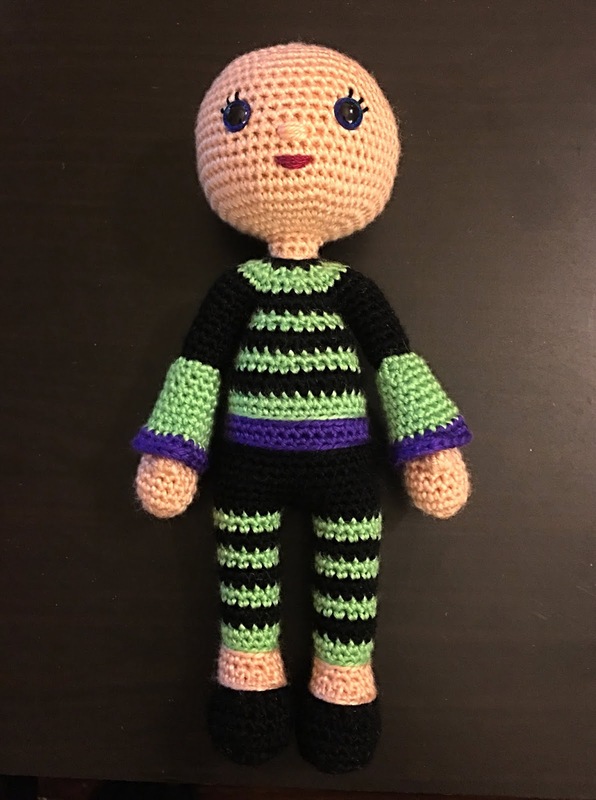 This doll is designed with a built in neck support so you will not need any additional materials for this. Gather your materials this week so you're ready to go! 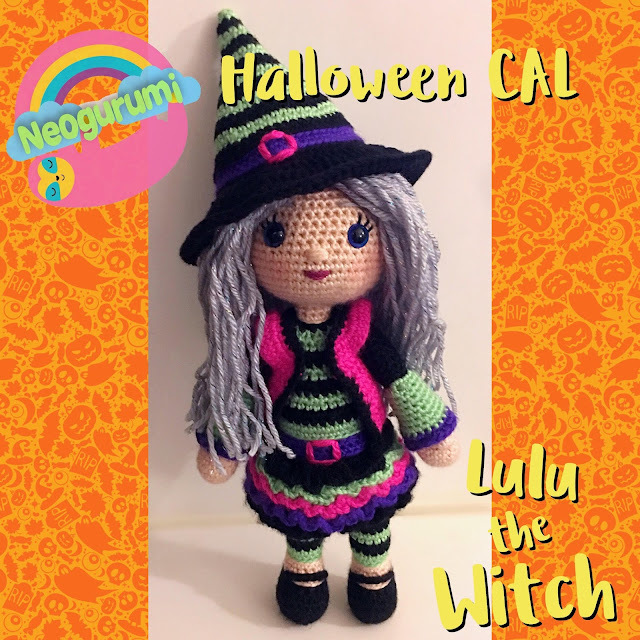 Saturday, October 6th: Share your finished doll! The parts of the CAL will be posted here each day. Join my Facebook group to share your progress along with us! R9-16: 10 sc (10) Change to black on the last st of R16. Holding arm upside down, join green yarn to FLO of R18. R9: 21 sc (21) Change to purple on the last st of this round. R7: 6 sc, hdc dec x 6, 6 sc (18) Change to skin tone on the last st of this round. R11: 14 sc (14) Change to green on the last st of this round. R14: 14 sc (14) Change to black on the last st of this round. R15-16: 14 sc (14) Change to green on the last st of R16. R17-18: 14 sc (14) Change to black on the last st of R18. R19-20: 14 sc (14) Change to green on the last st of R20. R21-22: 14 sc (14) Change to black on the last st of R22. R24: (6 sc, sc inc) x 2 (16). Change to green on the last st of this round. FO the 1st leg but not the 2nd. 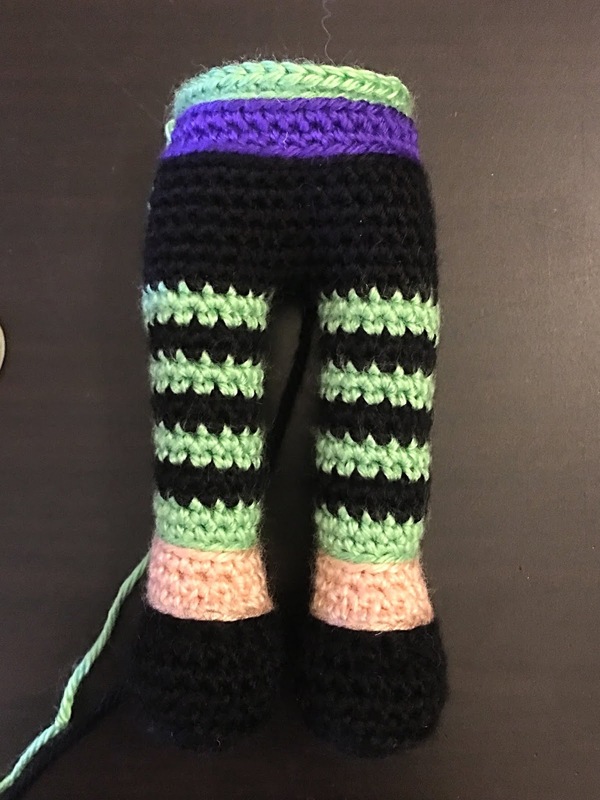 Tomorrow you will join the legs and continue on to the body. Start with a long tail, ch 8, FO with a long tail. Use the tails on either side to sew to the shoes. Change color to BLACK - continue from where you left off on the 2nd leg. R7: 7 sc, sc dec, 16 sc, sc dec, 9 sc (34) Change to purple on the last st of this round. R10: 34 sc (34) Change to green on the last st of this round. R13: 10 sc, sc dec, 15 sc, sc dec, 5 sc (32) Change to black on the last st of this round. R15: 10 sc, sc dec, 14 sc, sc dec, 4 sc (30) Change to green on the last st of this round. R17: (8 sc, sc dec) x 3 (27) Change to black on the last st of this round. R19: (7 sc, sc dec) x 3 (24) Change to green on the last st of this round. R21: (2 sc, sc dec) x 6 (18) Change to black on the last st of this round. R23: 38 sc (38) Change to green on the last st of this round. R25: (2 sc, sc dec) x 8 (24) Change to black on the last st of this round. R26: sc dec x 12 (12) Change to skin tone on the last st of this round. 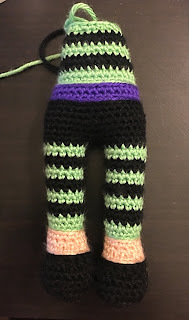 FO with long tail for sewing. 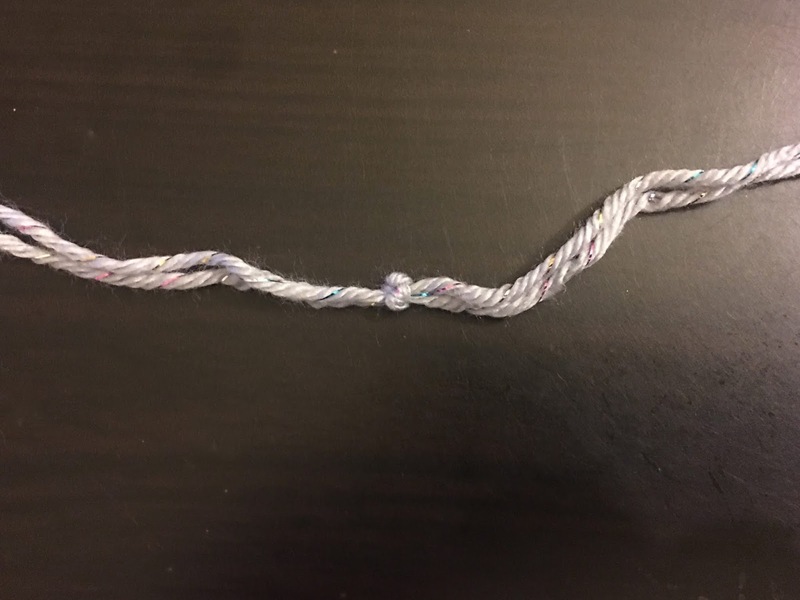 Whip stitch FLO and pull tight to close. Hide ends. 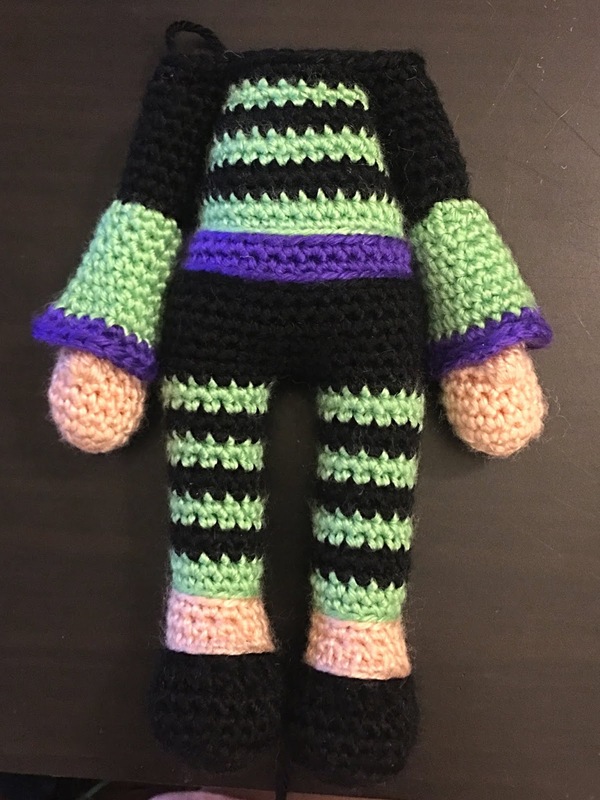 Join black yarn to FLO of R7. Join skin tone yarn to FLO of R29. Insert safety eyes between R12-13, 8 sts apart. - Add eyelashes to using black embroidery floss. - Stitch a nose between R10-11 of the head. 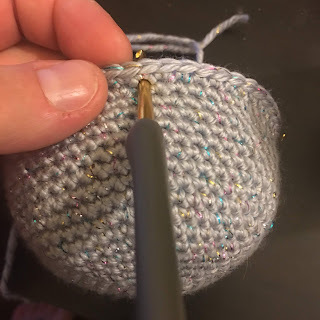 - Embroider a mouth between R8-9 of the head. FO, leaving long tail for sewing. 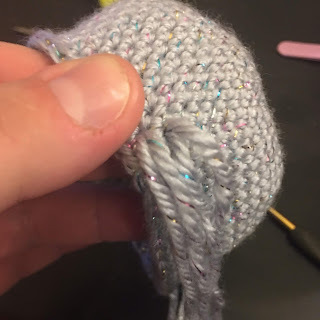 Move on to attach hair to the hair cap. Below are photos of one way I like to add hair to a hair cap. 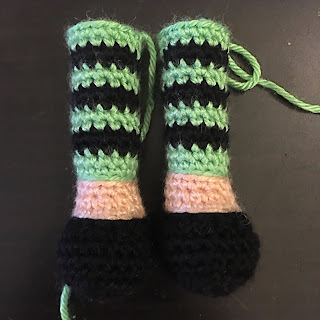 Start with 2 cut lengths of yarn. 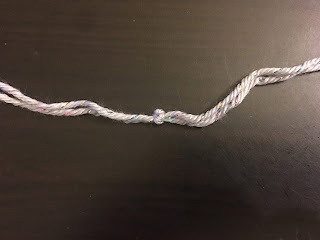 Double knot them together. 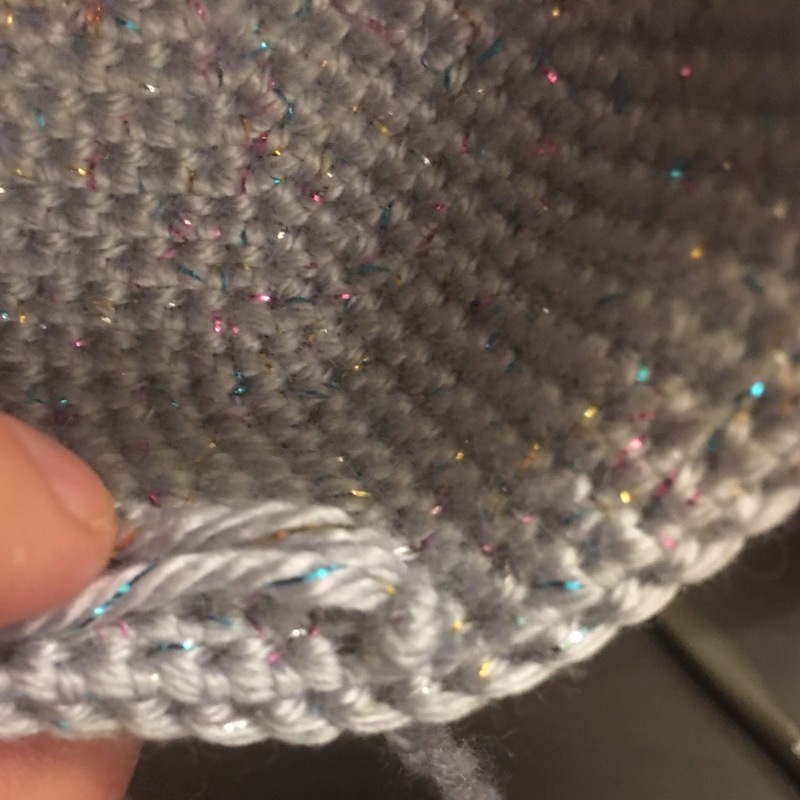 Insert hook into the top of the hair cap, and pull one strand of yarn through until the knot stops it from coming any further. 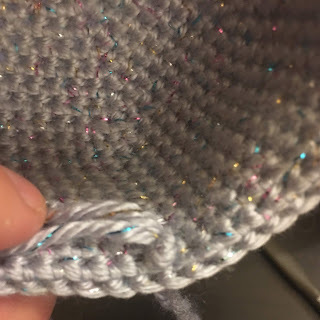 Then insert hook into an adjacent hole between sts on the the hair cap, and pull another strand through. Repeat 2 more times so you now have 4 strands of hair in 4 holes. This method will prevent the hair from ever coming out of the hair cap. TIP - When adding hair, always fill out the front and the middle top of the head, and then space out each 4 strands of hair by 3-4 sts as you go around the head. If you add too much hair the head will be too heavy. If you need to, you can always go back and fill in later. Once you have added enough hair, sew the hair cap on to the head. Trim up and neaten the hair. R9: Using black, sc around the vest, working on the top and bottom and the sides to add the black edging. R2: (1 sc, sc inc) x 2 (6) Change to black on the last st of this round. R4: (1 sc, sc inc) x 3 (9) Change to green on the last st of this round. R6: (2 sc, sc inc) x 3 (12) Change to black on the last st of this round. R8: (3 sc, sc inc) x 3 (15) Change to green on the last st of this round. R10: (2 sc, sc inc) x 5 (20) Change to black on the last st of this round. R12: (3 sc, sc inc) x 5 (25) Change to green on the last st of this round. R13: (4 sc, sc inc) x 5 (30) Change to black on the last st of this round. R15: (5 sc, sc inc) x 5 (35) Change to green on the last st of this round. R17: (6 sc, sc inc) x 5 (40) Change to black on the last st of this round. R19: (7 sc, sc inc) x 5 (45) Change to green on the last st of this round. R21: (8 sc, sc inc) x 5 (50) Change to black on the last st of this round. R23: (9 sc, sc inc) x 5 (55) Change to purple on the last st of this round. R26: (10 sc, sc inc) x 5 (60) Change to black on the last st of this round. - Add details to the face if you haven't yet. 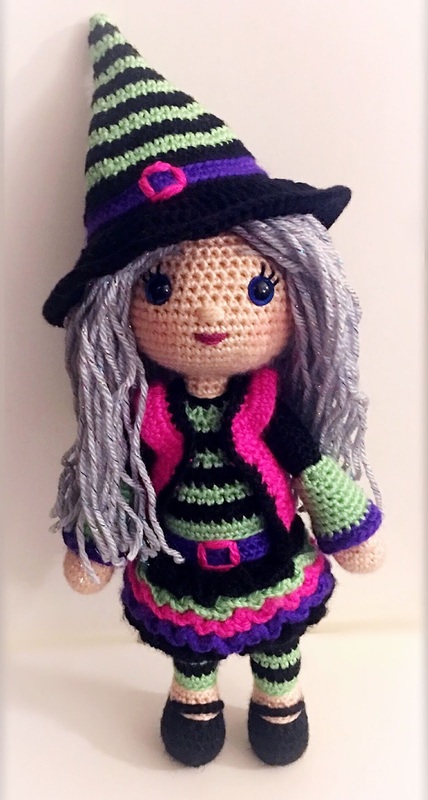 - Using pink yarn, add a buckle to the belt and to the hat. © Jessica Doering & © Neogurumi. No unauthorized reproduction or distribution of this pattern or content, in whole or in part, is permitted. 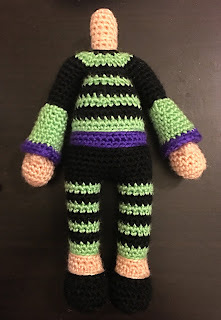 You are free to sell any finished projects made with this pattern, but please give credit when doing so. 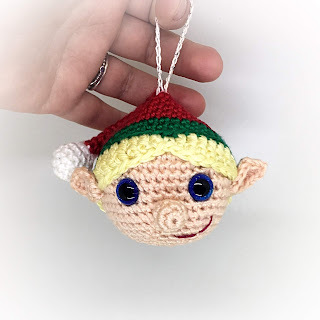 A link back to the pattern page is appreciated.